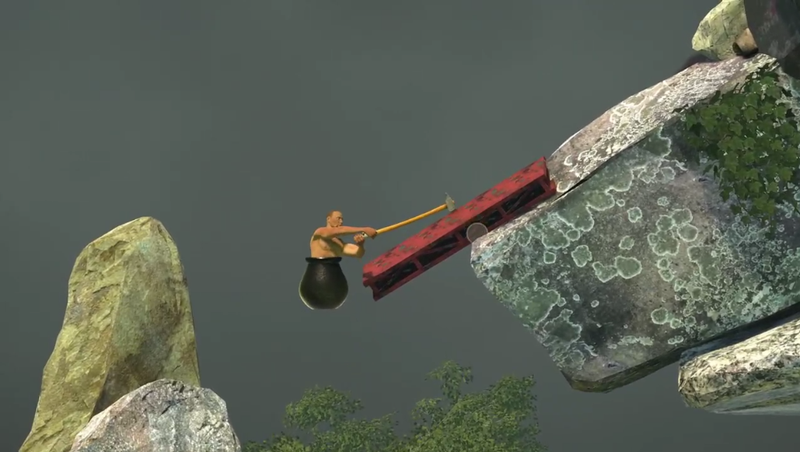 Getting Over It With Bennet Foddy is a nonsensical game that challenges players to climb a mountain with a hammer. The silly premise and highly animated reactions from streamers who take a tumble have launched it right to the heights of Steam’s best seller list one day after its release on the platform. It looks like a nightmare but is actually very relaxing with the right mindset. You do one thing in Getting Over It: climb. Using either a mouse or a stylus, you swing a hammer to scale a ridiculous mountain hell of sheer rocks and random garbage. It’s created by Bennet Foddy, who also made floppy running simulator QWOP. It’s absurd to control, and a single mistake can lose all of your progress. YouTubers like PewDiePie have yelled in frustration upon failure while, speedrunners have turned the game into a gorgeous whirlwind of tricks and skips. Now, the game is a higher seller on Steam than PlayerUnknown’s Battlegrounds. Kotaku’s resident video game expert Tim Rogers called Getting Over It a “desk toy for freaks” and a “game that defies tutorials.” (Disclosure: Rogers is friends with Bennet Foddy.) I played Getting Over It last night on Kotaku’s Twitch channel and found myself agreeing. Getting Over It is both a devious torture device and a strange playground. Unlike the many streamers who ragequit after losing progress, I found myself greatly enjoying the climbing process in spite of many failures. What makes Getting Over It work isn’t just its propensity to create meme-tastic reaction videos, but also how remarkably straightforward it is as an experience. All you have to do is go up. I found figuring out a technique for doing so a surprisingly relaxing process. Failure can cost you time, but it doesn’t rob you of the many miniature successes and revelations you’ve had along the way. During my stream, viewers in chat expressed anxiety and even said they were experiencing vertigo, but I found Getting Over It to be very calming. Getting Over It’s success rests beyond the anger. The simple goal and iterative learning process makes it easy to focus on and exciting to master. It appeals to a primal urge towards improvement. Players climb Foddy’s mountain for the same reason people climb Mount Everest: because it is there.